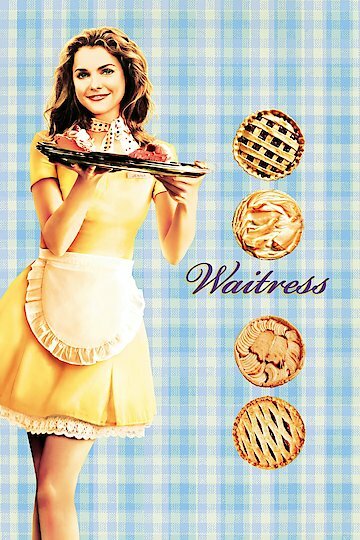 "If only life were as easy as pie"
The movie Waitress is a comical and engaging story with feminist undertones written and directed by the late Adrienne Shelly, who also plays a supporting part in the film. The story follows a young waitress named Jenna, played by Keri Russell, who is unhappily married to her husband Earl, played by Jeremy Sisto. Jenna she plans to leave her husband using money she has been hoarding and money she plans to win by utilizing her talents in a pie baking competition. Much to her dismay, Jenna learns that she is pregnant, which complicates her plans to leave Earl. Complicating things even more, Jenna begins to have an affair with her doctor, played by Nathan Fillion. Dr. Pomatter is also married, which creates a messy situation for all involved. Although she knows she is wrong to get involved with her married doctor, the affair Jenna has with Dr. Pomatter invigorates her and gives her a sense of joy and happiness that she's never felt before. However, that happiness comes at the price of knowing what she is doing is wrong. Luckily for Jenna, she has two waitress friends, played by Shelly and Cheryl Hines, as well as the owner of the restaurant where she works, an old man named Joe played by Andy Griffith, to lean on for support and advice during these difficult times. The other waitresses have secondary story lines that help give the movie some heart and some comic relief. Things come to a head when Jenna finally goes into labor, during which she confronts her future as it pertains to both Earl and Dr. Pomatter. In the end, Jenna shows the strength to do the right thing, and with a little help from her friends, as well as her baking skills, she is able to start a new life with just her and her baby. It makes Waitress an entertaining movie that holds a good message. Waitress is currently available to watch and stream, download, buy on demand at Amazon Prime, Amazon, Vudu, Google Play, FandangoNow, iTunes, YouTube VOD online.